George E. Brockway, Port Huron, MI. Bottsford sold his shares to A.K. Coleman before enrollment. 22 + 40 x 30", 460hp @ 100rpm engine, Cuyahoga Furnace Co., Cleveland, OH (1871). Boiler from Cleveland, OH. 1871, May Launched Port Huron, MI; received machinery at Cleveland, OH. 1871, Aug 11 Enrolled Port Huron, MI. 1871, Aug 24 Grounded foot Bois Blanc Island, Lake Huron; released by tug VULCAN. 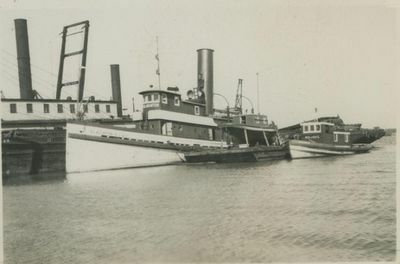 1874, Jul Collision with propeller LOWELL, St. Clair River. 1874, Sep Broke wheel on Lake Erie. 1879 Owned Murphy, Detroit, MI. 1882, Aug Collided & sunk MOCKINGBIRD, Detroit River. 1882, Aug Carried 3,000,000 pine logs down Lake Huron to Lake Erie. 1883 Broke wheel, Saginaw Bay. 1884 Owned Detroit Tug & Transportation Co.
1884, Dec Released steambarge MORLEY stuck at Grand Marais. 1885, May Dispatched to Lake Superior. 1886, Aug Received boiler of wrecked KATE MOFFAT; will tow regularly at Milwaukee, WI. 1887 AuTrain, Lake Superior - Bay City, MI with timber stowed in bay booms. 1890, May Towed barge MABLE in Escanaba, MI ore trade. 1892 Owned Kelsey & King, Detroit; new 22 + 40 x 30", 460hp @ 100rpm steeple compound engine by S.F. Hodge Co., Detroit; 1 firebox boiler 10'5" x 16', 100# steam by Dry Dock Engine Works (1881), possibly from KATE MOFFAT; engine may have been rebuilt. 1895, Oct Burned at Sault Ste. Marie; scuttled & sank. 1896, May Raised & rebuilt by A. Stewart, Port Huron; reinforced bow for working in ice; 207 gross / 87 net tons; engine rebuilt by Samuel Hodge & Co., Detroit, 22 + 40 x 30", 700hp @ 100rpm steeple compound engine; second boiler 10'3" x 16' @ 100# steam by Dry Dock, Detroit. 1901 Owned Lake Superior Split Rock Lumber Co.
1904 Owned Thomas D. Merrill, Duluth. 1909 Owned R.B. Knox, Duluth. 1910 Owned Duluth Superior Dredging Co., Duluth. 1934 Rebuilt, 1 deck, new steel cabins, 121.5 x 22.6 x 11.2'; 1 firebox boiler by Johnston Brothers, Ferrysburg, 10'6" x 16', 140# steam, 177 gross/ 65 net tons; company later bought out by Dunbar & Sullivan Dredging Co.; transferred to Detroit. 1955 Laid up Stoney Island, Detroit.